a good hostess always keeps her guests waiting while she takes photos of the food. I love Sunday night dinners. That’s one of the things I miss most about not living at home (let’s be honest; I’m still home for many Sunday night dinners). So, every now and then, I like to have people over for a nice meal and a few pinches of wine on a Sunday. That’s what I did this week. My Nana gave a set of pasta dishes – something that has been sorely lacking in my kitchen – when I went to see her in New Hampshire a few weeks ago, so I was eager to use them. 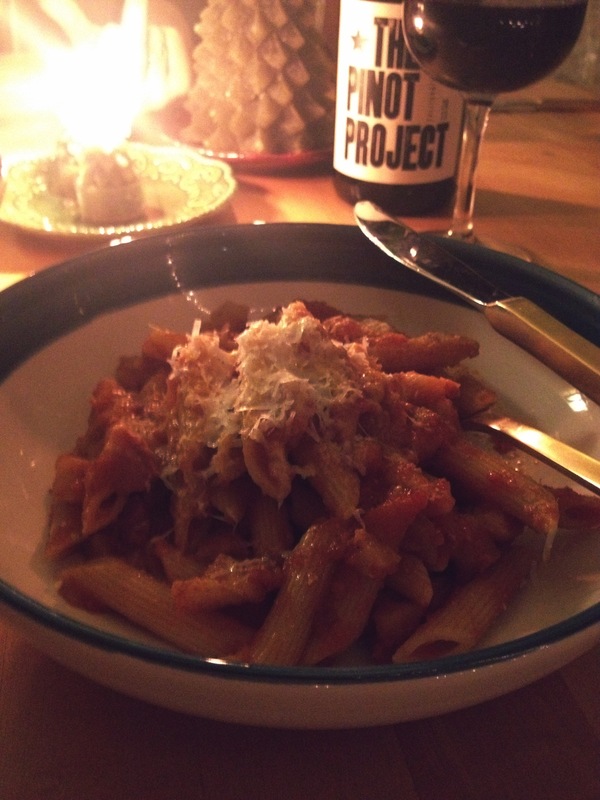 I invited my friends Atlee, Greg, and Emily over for a feast of pasta all’amatriciana. 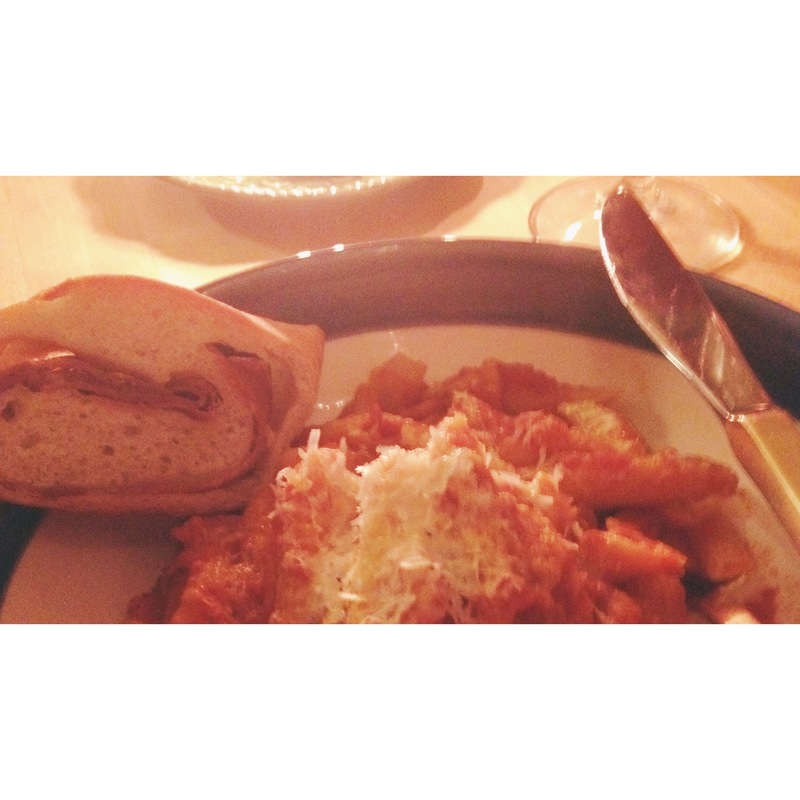 I had this dish the first time I went to the The Pasta Shop in Bushwick (which, by the way, I’m not sure is even still open?! Anybody know anything about this??) and I loved it. I’m not the biggest fan of red sauces on pasta, for the most part. I usually make pasta with pesto, or spaghetti aglio e olio, and I love making carbonara. But this pasta really stuck with me. So when I was poking around the internet for a new recipe to try, I was really excited when I found this one! 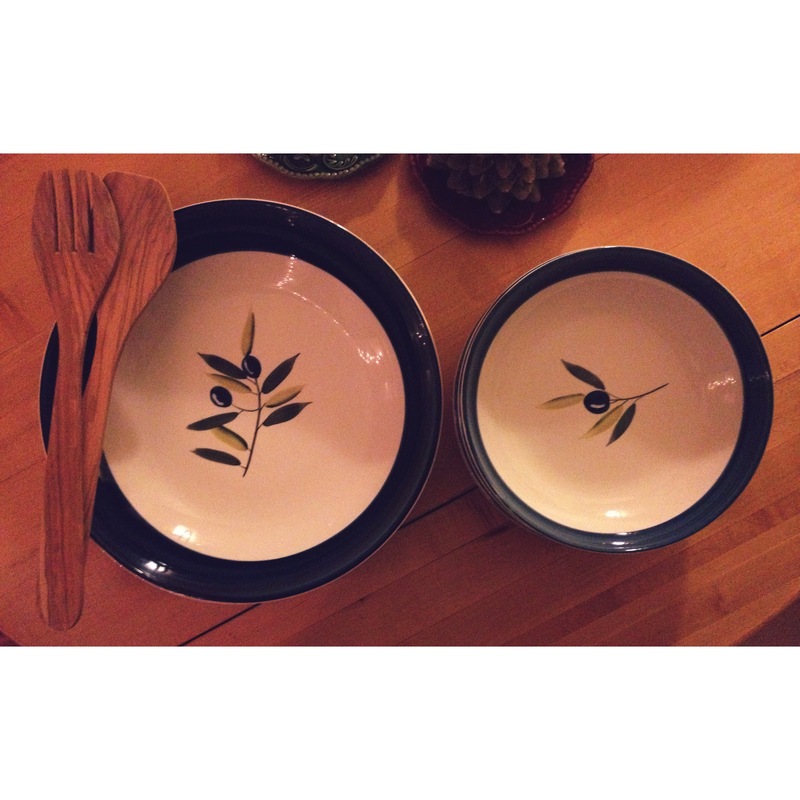 i’ve been longing for a pasta set and now i have a beautiful one from my Nana! I even decided to go somewhere to get the guanciale, which you cannot find in your grocery store, unless you live somewhere magical (or probably in Little Italy). Guanciale is a cured meat from the pig’s jowl. Mmmmm, sounds good right?! Well, to me it does. It’s the traditional protein used in a lot of Italian, specifically Roman, pastas. (Or at least that’s what I learned while watching this video of an awesome old Italian guy making carbonara. I love his little tongs.) The thing to realize is that it’s very fatty, especially if it’s not the best quality. Unfortunately, I got a verrrrry fatty piece. And being the glutton that I am, I got extra guanciale for this recipe, which wasn’t completely unfounded because it called for fifty-six ounces of tomatoes and only eight ounces of meat. What’s that about?? So I bumped it up from four ounces to eight ounces of guanciale, plus four ounces of pancetta. Knowing what I know now, I would: 1. Try to find better guanciale, and 2. 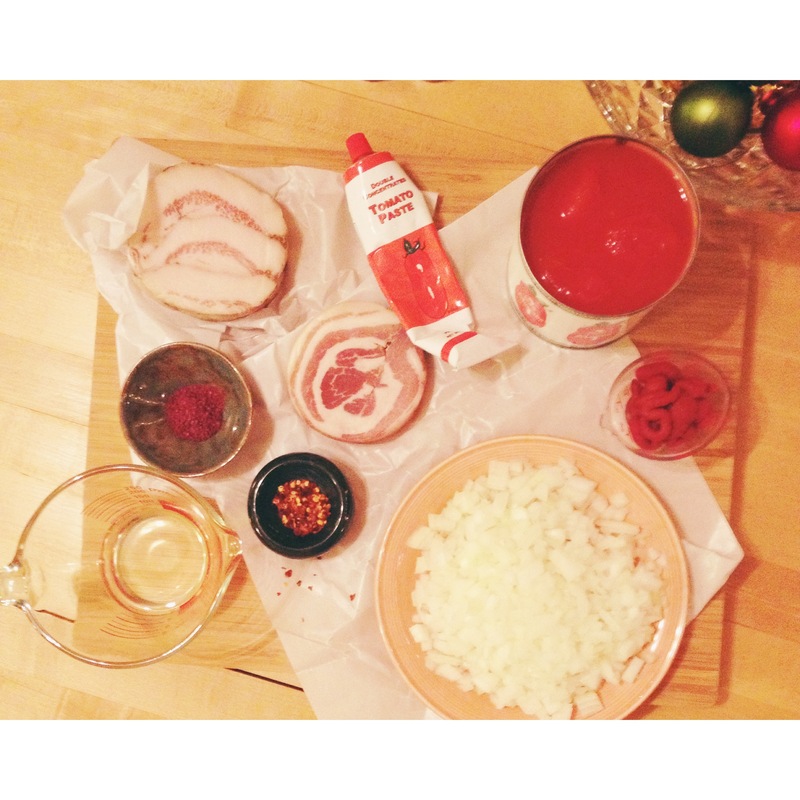 Bump up the amount of pancetta, which is usually a little meatier, instead. 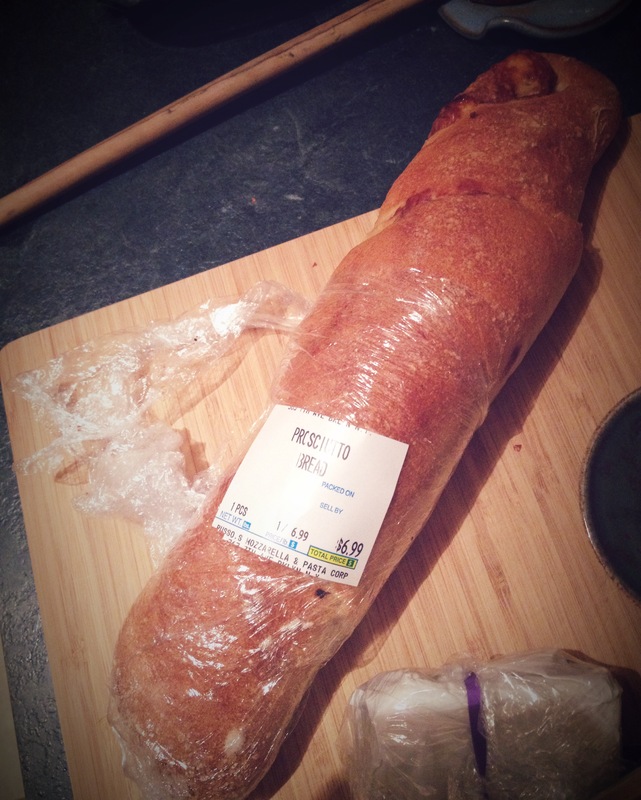 I should also note that if the butcher asks if you’d like him to chop it for you, just say yes. Don’t say, “Oh, thanks but that’s okay, I like chopping!” Because chopping a hunk of fatty meat takes time and it’s hard! That’s why I didn’t finely chop it as the recipe called for. What I’m getting at is that there were a lot of fatty globs in the sauce that weren’t even really crispy. The meat needs more time to crisp up. Next time (if I ever do re-try this particular recipe), I think I’ll cook the meat first (after having it finely chopped by a butcher because I have other things to do, sorrryyyyyyyyyy), then go in with the onions and proceed with the recipe from there. I’d also halve the amount of peeled tomatoes in there because it’s SO MUCH. I added a half pound of pasta, not only because Greg loves pasta so much and stuffs his face with it is a growing boy, but because I already knew how much sauce that would make – A LOT. Don’t let any of what I’ve said deter you from using guanciale; just check your quality and when in doubt, use it sparingly. 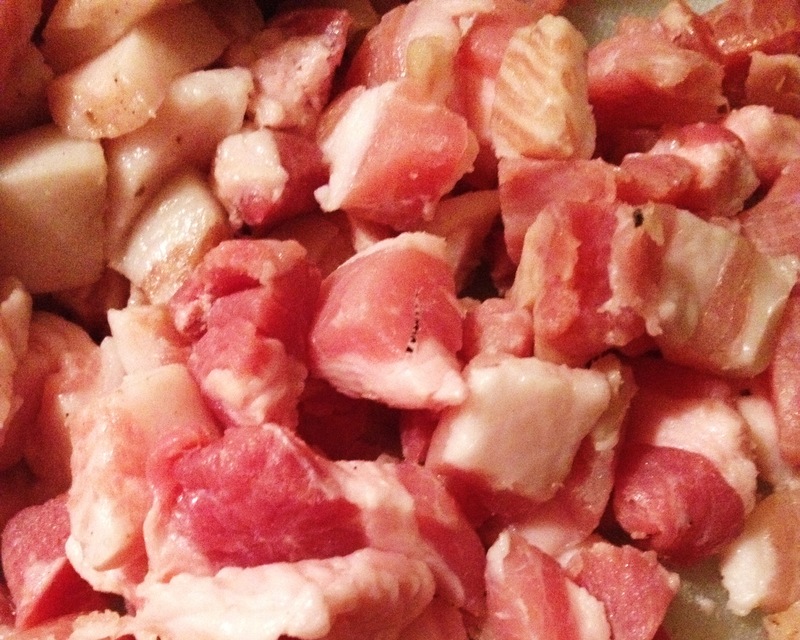 Pancetta is much more accessible and, I think, easier to cook with, but sometimes guanciale is really what you need. Not-so-great photos brought to you by mood lighting. *This post is not sponsored by the Atkin’s Diet. mmmmm, a pile of carbs with cured met and cheese. Puree tomatoes and juice in blender; set aside. You may need to do this in batches. Heat oil into a heavy-bottomed pot over medium-high heat. 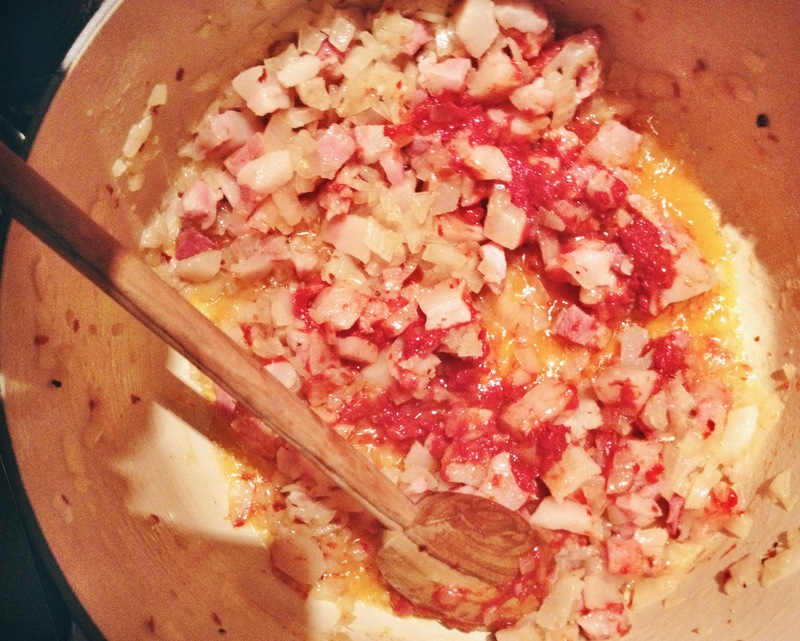 Add onion, guanciale, pancetta, red pepper flakes, and ½ cup of water. Cook, stirring occasionally until water is evaporated and fat begins to render, 8-10 minutes. Add tomato paste and cook, stirring often, until it begins to brown, about 2 minutes. Add wine, continue to stir often until it’s reduced by half, about 5 minutes. Add the tomato puree and bring to a boil. Cover pot partially with a lid, reduce heat, and simmer for 45 minutes. When the sauce has been cooking for about half an hour, cook pasta in a large pot of boiling, salted water, stirring occasionally, until al dente. To sauce: Add sugar, if using, salt and pepper to season. Add the pasta and a little bit of the pasta cooking water to sauce and toss to coat. 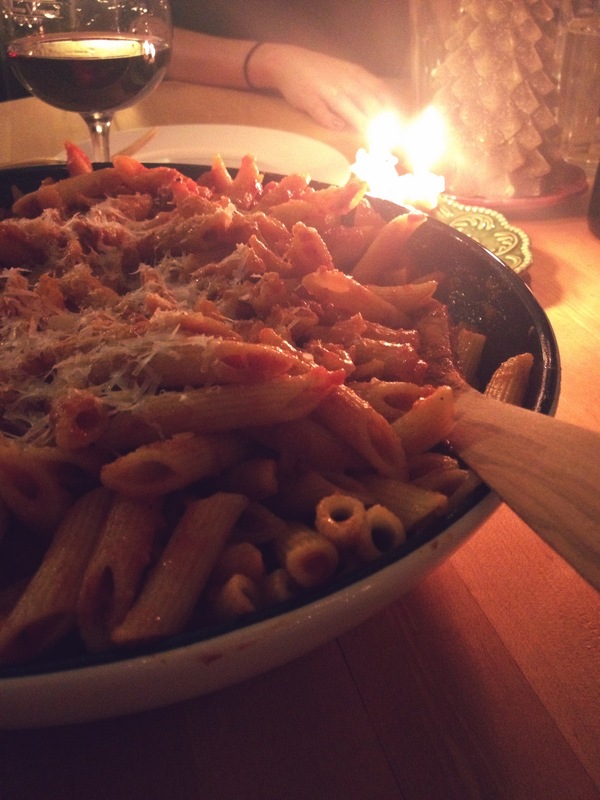 Put your pasta in a big ole serving dish, sprinkle with Pecorino or Parmesan, and serve!